Crafted from premium leathers and meticulously constructed for all-day wear, CC Corso Como® shoes put the perfect finishing touch on office to after-hours looks. Great arch support and footbed. I love this brand and was very disappointed in these shoes. The size was too small even though i have other shoes by this brand. The toe coverage was minimal. So for me lots of toe cleavage which i hate showing. These shoes run 1/2 size small. Normally wear 7.5M. Ordered these in a 8M. The toe box run narrow therefore the M width feels very tight. The Hot Sauce is really a nice color. The width of the shoe is impossible so unfortunately I will need to return. Love this shoe. 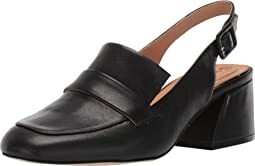 Comfortable heel and soft leather. Great fitting wedge, would be perfect for casual nights out or edgier daytime styles. The straps fit comfortably and allow ease of movement. Not a lot of padding, so ball of foot pads might be necessary if you plan to be on your feet a lot in these. 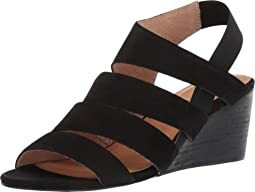 fit was ok, I really wanted red shoes, but these are close to orange, the on site picture did not show the true color, and also the to me the very unattractive round heels. the shoe looks quite different than the ones delivered. 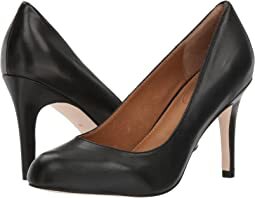 These shoes are very well made and much higher quality than many other women's dress shoes. Unfortunately they are too narrow for C/D width feet. I wish they made these in wide width. I always wear a 7.5 in a shoe and this felt a full size narrower than a medium width as I usually wear. I am really sorry because I love the shoe but it does not come in a larger width so I cannot try that. So very disappointed. I just love these new boots! They are so cute and I feel very hip and fashionable in them. I purchased the light gray, and they are very light in color. Hopefully they won’t get too dirty. I’ve worn them with blue and black jeans and they seem to go with anything. They are also surprisingly comfortable with a nice cushioned insole. Plus my dress orthotics fit in them. All you need is a pedicure and peep toe socks and you’re ready to rock these boots! The fit was perfect and met my usual size 7 for heel expectations. 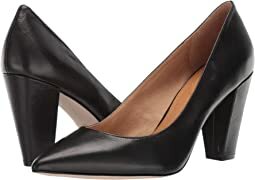 The style is a classic, elegant black heel that you can wear with virtually anything. I got the soft leather show and am very excited to wear them out. They seem very comfortable for heels and the height! Love these shoes! I was shopping for shoes for my daughter's wedding and had to pick only one pair to go with my dress. These, while beautiful, sadly were just not the right style for the dress I plan to wear. But I highly recommend these shoes. They are beautiful and comfortable! I wish I had someplace else to wear these gorgeous shoes. Vert flatering feminin design however runs too large and the heel feels too wide. I wear 11 M and that's what I ordered but they are too big. Also the color is much more yellowish in person almost like dark mustard color. The inside padding on this shoe was phenomenal—until you start walking around. 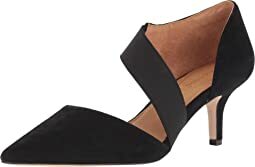 The heel is very inflexible and while it's padded well on the inside, it hurt the bottom of my heel when walking around on carpeted areas in my home. I couldn't imagine how much it would hurt after a day walking in the city so I returned them. Might be okay for in office, sitting at your desk kind of lifestyle but definitely not ideal for tourism/city walking like I was looking for. These are sooooo wide! I couldn't even walk in them. I liked the squishy sole, it felt pretty comfortable. If only it stayed on my foot. These are some of the poorest quality shoes I've owned. I have worn them to work 5 times and they look 20 years old. This shoe is a bit narrow, which works well for me because I have a hard time finding a shoe that is narrow enough. Love the low cut toe cleavage, it's stylish AND comfortable. These are really comfortable and cute! Typically I’m a size 5 or 5.5 and went with the 5 which was a good decision. Great with flared jeans. 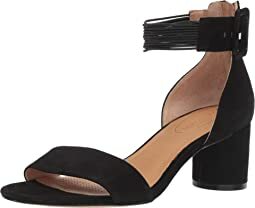 I loved the first pair of the CC Corso Como Julia shoes I purchased, so much that I ordered a 2nd pair a few months later - the exact same shoe, style and color. 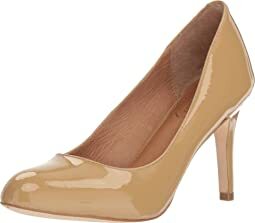 When the 2nd pair arrived, I wore them only 1 day - after a few hours, the right shoe heel started clicking with each step. I spoke with a Zappo representative and exchanged the defective pair for yet another pair. Unfortunately, the replacement pair had the same defect. Though I love the style, I'm returning the 3rd pair for a full refund. The manufacturer should look into this as I'm sure I'm not the only customer who has experienced this defect with the heel clicking. Love the shoe style and comfort; hate the noise. It's embarrassing to wear them. Love these shoes! They are comfortable, they go with everything and the leather is really nice. They look great! I don’t usually buy shoes online, but I’m so glad I purchased them! really liked this shoe however it was just too wide for me. wish they made more narrow sizes. 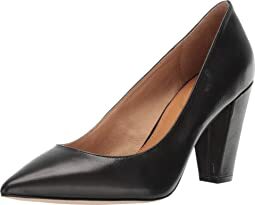 The look of this shoe is great but the pointy toes push my feet at the tips and eventually these hurt my feet. And I do not have problems with my feet. Wish they had some better padding in the ball and toe area that would alleviate stress to that part of the foot. Sadly , I returned them. I love these shoes! 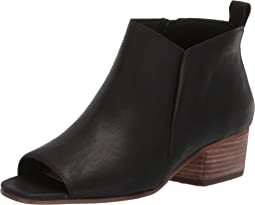 They are cute and comfortable- good heel height and are easy to walk in. Great shoes!! I love them! Very cute and comfortable!! Unwearable. These shoes DESTROYED my feet. Those minor annoying rubs don’t go away, they evolve into major bloody blisters. I kept trying to make them work because of what they cost me, but had to trash them. And they run really big: I normally wear a wide width but comfortably bought the regular width. They were still too big and sloppy. This purchase was a total regret and waste of money. Based on the other reviews, I feel validated. Not just my experience. 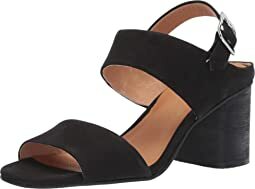 This is a very comforable shoe and I like the height of the wedge heel. I was looking for a gold sandal and just didn't like the glittery gold look of this shoe.